An innovative, multi-million dollar James Cook University drought experiment that covers a hectare of rainforest is underway. 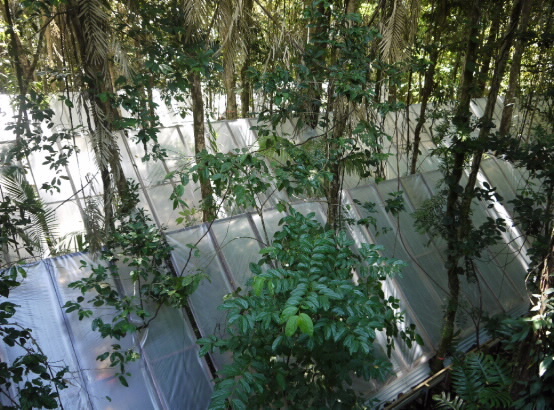 An innovative, multi-million dollar James Cook University drought experiment that covers a hectare of rainforest is underway and is set to deliver crucial insights into how rainforests will be affected by climate change. JCU’s Associate Professor Susan Laurance is running the world’s first drought project in the Daintree rainforest near Cairns. After more than two years of preparation, construction of the huge ‘rainforest laboratory’ is now complete. Scientists are trying to determine which rainforest trees will survive drought and which will be damaged or die. Tree roots have been covered with clear plastic roof panels to limit their access to water, leaving others uncovered as a control group. The forest’s progress will be monitored by a field of around 600 sensors and the use of JCU’s 47 metre-tall ‘canopy crane’ – an elevated platform moving around the treetops, enabling researchers to get a birds-eye view of the experiment and accessing tree leaves from above in order to understand how they cope with a drying climate. Dr Laurance says her team has been collecting data for more than a year as the structures were built, but now that the final touches have been made the site is fully operational. She said it’s crucial work. “We estimate there are at least 45,000 tree species in the world’s rainforests but only 1% of the species stores about 50% of the carbon. We are trying to discover which tree species are most vulnerable to drought and which are more resilient. We will then know what the implications will be for future carbon storage, if droughts become more common. A/Prof Laurance said the latest figures show a significant decline in global rainfall over the past thirty years. She said if tree species that were important for carbon storage were vulnerable to drought it was possible the rainforest itself could become a source of carbon. The experiment is scheduled to run until 2017.